Junk cars for cash in Rhode Island with free pickup. If you have a junk car rotting away on your property in Rhode Island, don’t try and roll it into Narragansett Bay. There’s an easier way to get rid of your junk car, and that’s calling The Clunker Junker right now! Not only do we pay cash for cars in Rhode Island, but we are the top junk car buyer in the state. We pick up cars free of charge and tow them away, all usually within a few business days at most and one business day at best. We’re ready to pay big money for junk cars in the nation’s smallest state. Newport may be known for its 10 mile drive of huge mansions and estates, but not everyone in Rhode Island is a billionaire. If you’re like the rest of us and need some quick cash, we would be happy to buy your junk car in Rhode Island. Don’t worry if your car doesn’t start, has rusted away from road salt, or was involved in an accident on I95. Whatever condition your car is in, we will make an instant cash offer. Whether you’re selling a car in Providence or out in the more rural areas, we will come to you and pick up your junk car free of charge. After all, it’s only 37 miles to get across the Ocean State! When you sell your junk car in Rhode island to The Clunker Junker, you’ll have more time and more money to grab some stuffed quahogs or clam cakes down at Flo’s clam shack (The best in the world!). If seafood isn’t your thing, check out a Pawsox game down at McCoy Stadium, but hurry before they leave the state for good!. There’s no easier way to get cash for junk cars in Rhode Island than The Clunker Junker, so what are you waiting for? Use the form on this page to get your instant offer right now. Regardless of where you are in the state, The Clunker Junker is here to help. We’re able to work with you no matter your location or the condition of your car. You don’t even have to have the title – almost a fourth of the cars we’ve bought in Rhode Island with cash didn’t have a title. In fact, Rhode Island won’t even issue a title if your car is more than 10 years old. Check out our online tool to start your quote. You’ll need to enter the year, make, model, and trim information to start the process. Next, you’ll provide us with some information about the condition of the vehicle. While we take cars in any condition, we need accurate information to provide you with an accurate quote. We’ll also ask you about documentation. If you don’t have the title on hand, let us know so we can get you an accurate quote. With newer vehicles, you may need to provide additional information. We may ask you to provide photos of the car or proof of ownership before providing you with a quote. However, we strive to make the process as quick and easy as possible.Once we have all the information we need, we’ll provide you with the best quotes from around the state – it’s just that easy. We work with salvage yards all across Rhode Island to ensure you get the top value for your junk car. While we are unable to buy every car submitted to us, we’ll be able to tell you right away if we can make an offer on it. There’s no obligation to accept our instant offer. If you’re ready to sell, we’ll ask for a few more pieces of information from you and then schedule a pickup. Once our quote is accepted, we can pick up some vehicles within 48 business hours. A junk car removal specialist will meet you at the car, give the vehicle a quick inspection, and then pay you. You don’t have to wait for your check or cash – the driver taking your vehicle is the one who pays you.We don’t have any hidden fees – the price you’re quoted is the price you’re paid. This makes removing your junk car easy and painless. There’s a pretty wide range of possibilities when it comes to what you can earn for your clunker. Is That even still a Vehicle? These are the junkers that saw their hey-day come and go many years ago. These are recycled for raw materials and usually don’t have any parts worth salvaging or saving. You have no use for a car or truck in this condition, so why not get some cash for it? Vehicles like this can get you anywhere from $50 to $125. It’s Not So Bad, is It? These are the clunkers that are definitely not seeing the road again, but still have some sought-after parts that can find new homes in other vehicles. Junk cars like this will net you a little more than the ones in the “pure junk” category. We aren’t limited to junk cars only. We also buy used vehicles and can usually pay even more than other junkyards in RI. For a car or truck like this, you can see anywhere from $200 to $10,000 depending on the condition and model. To find out more about the cash value of your junk car, try using our online tool. We have put together a simple guide and example for how to sign your Rhode Island title when you are selling your vehicle. If there are multiple owners listed on the title, they must all sign the title unless the names are separated with "OR". 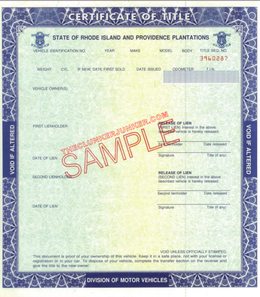 On the back of your Rhode Island title is a section that says "Transfer by owner". This is the section you should use when you sign and print. Ignore the sections that talk about dealer reassignment. Anything you write there could make the title unusable. 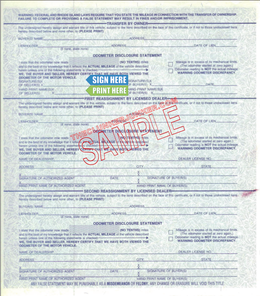 First sign the back of the title where indicated by "Signature(s) of Seller(s)" (see image). 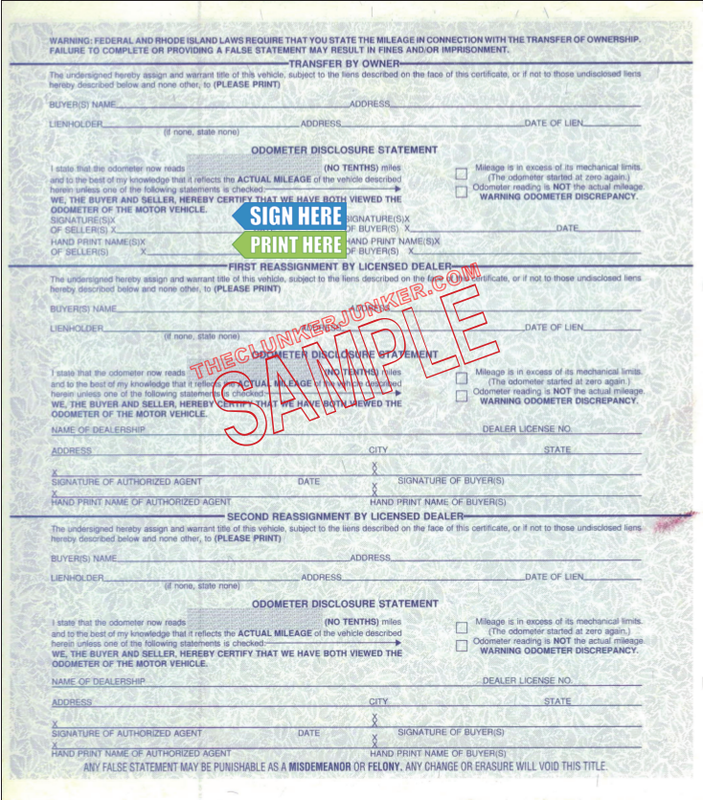 Print (don't sign) your name on the back of the title where it reads "Hand Print Name(s) of Seller(s)". Fill out the Rhode Island Application for Title. Bring your application to the DMV headquarters in Cranston (Duplicate titles are only handled at the headquarters). Please note that there may be a waiting period before a duplicate title can be issued and the cost is $51.50. (Paid to the RI division of motor vehicles). Getting rid of an abandoned vehicle in Rhode Island can be a difficult process. Unfortunately, you cannot just sell any junk car that ends up on your property if you do not own it. You'll need to follow the Rhode Island abandoned vehicle removal procedures. We have given a general overview of what that entails below. To have a vehicle removed from your private property, you must first contact your local law enforcement office. They will dispatch a tower to remove the vehicle. If the vehicle has not been claimed within (45) days since notification of removal, the vehicle will be sold at public auction and the buyer will be granted a Bill of Sale or receipt of purchase to be used in applying for a title to the vehicle. Will you buy my car in Rhode Island if I don’t have the title? In many cases, yes! We can’t buy every car without title, but our buyers do make tons of offers on vehicles without documentation everyday. However, the offers are much lower and you’ll be required to present photo identification to prove you own the vehicle. It has to match a valid registration. 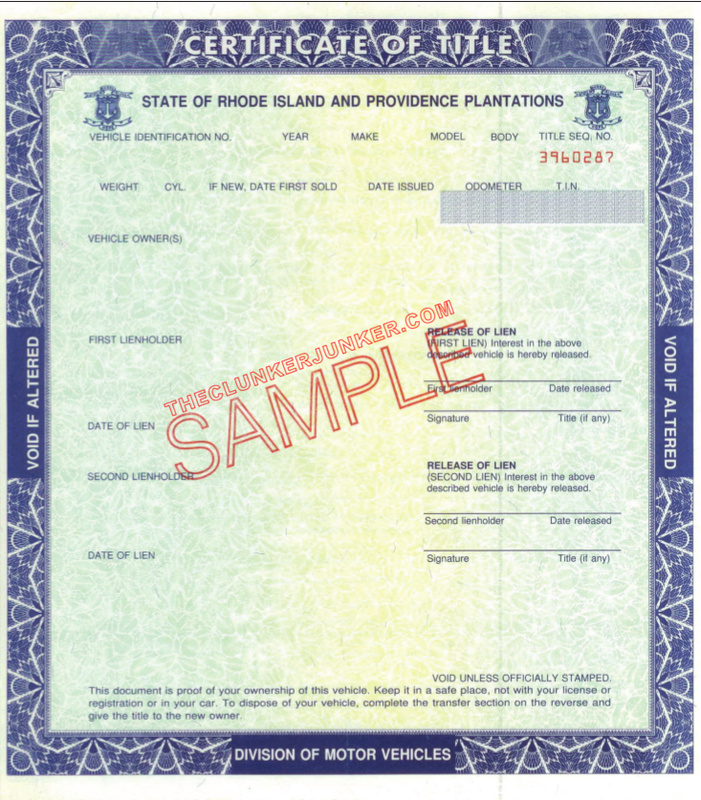 Rhode Island often changes their title documents from year to year. If you have questions about your specific title, please contact your Rhode Island DMV. Yes, unless you are transferring the plates to a new vehicle. You can return the plates to your local DMV office. You may need to notify your local DMV that you have sold the vehicle. You can contact them with any additional questions or concerns about the transfer of your title. If you’re ready to turn your junk car into cash, let The Clunker Junker help you. We pay cash for junk cars in Rhode Island. With no hidden fees and free pickup service, we make it easy to sell your junk car. Find out what your car is worth by filling out our online form today. "There is water damage on the carpets from when there was something wrong under the hood that caused water to leak and seep through on the front floors. There's some minor front-end body damage and some minor rear passenger door damage as well. " "This vehicle was a gift from my child's mother. Now, we are in an ugly custody battle, and every time I see this thing, it reminds me of her. I want to junk it. It runs absolutely great, and it's drivable all day on and off of the freeway. It fires right up. It's worth $1,500 according to Kelly Blue Book." "The reason I am junking the car is that I just moved to another state. I have no money or job at the moment, and I'm needing the cash, especially with a four month old. The title is not in my name, but it is on there as the buyer. I paid $800 for it. It drives well, and it seems to be a good car. It has four used tires and a new donut tire. It has front-end damage, minor hood damage, and the bumper is broken, but it's easily fixable. " "The control arms on both front sides need to be replaced. All of the tires are near the end of their lifespan, and the back passenger tire is completely deflated and came off of the rim. I want to junk it for cash because I just graduated from college, and it is time to get a new car." "The vehicle has a blown head gasket, and it likely has a cracked block as well. The interior shows its age. It has normal wear and tear. The roof has a dent that may be fist-sized in diameter, but it is shallow. " "The back window is missing, and that is all that's wrong with the glass, lights and mirrors. The car will start, but there is an electrical problem. We replaced the spark plugs, and it started up but died 30 seconds later. It will turn over, it just will not start." The Clunker Junker is one of the top junk car buyers in the state of Rhode Island. To date we have made instant offers on over 7 thousand vehicles across the state, totaling over $1.8 Million offered! Of those vehicles, approximately 23% were purchased without a title. We also buy cars on a wide spectrum of conditions and 47% of the vehicles we've made offers on in Rhode Island do not start or drive. Many also have moderate to severe body damage. Providence in Marengo County was our top producer, followed by Woonsocket.